African parliamentarians will for the first time debate on continental-wide issues at a new Pan-African parliament. The parliament with MPs from 53 member states of the African Union has been officially inaugurated in Addis Ababa, Ethiopia. 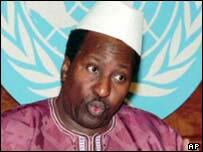 Commission chairman Alpha Oumar Konare said the members will craft the political road map of the continent. The union was set up in 2002, as a successor to the Organisation of African Unity (OAU). Only 190 MPs from 38 countries were sworn in at the official inauguration, attended by the current chairman of the AU President Joaquim Chissano of Mozambique. The MPs will meet at the first session to decide on the permanent base of the parliament. Egypt and South Africa have offered to host the legislative body. But the parliament will only advise the heads of state of the African Union, prompting criticism that it will become just another talking shop. The MPs elected a Tanzanian - Gertrude Mongella - as their speaker. African Union: What are its prospects?